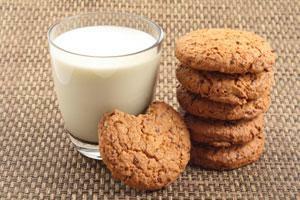 For diabetics, cookies can be an option. By looking for sugar-free cookies on grocery market shelves or by cooking up a batch of your favorite finds, you can enjoy delicious cookies without fear of blood sugar spikes. Be sure to check out our entire section related to diabetes here at LovetoKnow Diet. Like most things, diabetic cookies are readily available online. For example, Ruger offers sugarfree wafers made with NutraSweet in place of sugar. Murray sells an assortment of diabetic cookies and other goodies. There are several sugar substitutes available to replace the traditional white and brown sugar used in recipes. Each one will react differently to the baking process depending on the chemical composition of the artificial sweetener being used. It is best to test your recipes in small batches using alternant sweeteners to ensure proper baking. Most substitutes require less quantity as well since their sweetness is often highly concentrated. In this case, consider using half of regular sugar and half of substitute to be sure the batter gets the bulk it needs. You can use white or brown sugar, but half the amount in the original recipe first. The two best sugar substitutes for baking are Acesulfame K and sucralose. Dried fruit and spices are great additions for added flavor without all the sugar. In large bowl, beat butter or margarine on medium speed for 30 seconds. Add half the flour, the cornmeal, sugar, egg white, lemon zest, vanilla, cinnamon, and nutmeg. Beat until thoroughly combined. Stir in remaining flour and almonds. Mix well. Place dough by large tablespoonful on ungreased baking sheet. Bake in preheated oven for about 10 minutes or until golden. Let cool on wire rack. Preheat oven to 375 degrees. Spray cookie sheet with nonstick cooking spray. In medium bowl, beat butter or margarine on medium speed for 30 seconds. Add sugar, baking powder, and baking soda; beat until thoroughly combined. Beat in egg substitute and vanilla. In small bowl, stir together flours and cocoa powder. Gradually beat small amounts of dry mix into butter mixture and stir in remaining dry mixture by hand, if necessary. Dough will be thick. In wax paper, shape dough into two 12" logs and place logs on prepared cookie sheet. Flatten slightly to about 1 ½ " width. Bake in preheated oven for about 20 minutes or until firm in center and toothpick inserted in center comes out dry. Cool on cookie sheet for 1 full hour. Cut each log into ½" slices. Arrange slices with cut side down on cookie sheet. Bake slices at 325 degrees for 5 minutes; turn slices over and bake for additional 5 minutes or until crisp. Variation: Add 1/3 cup finely chopped dried fruit, such as apricots, mangos, cherries, or figs for a fruity flavor.